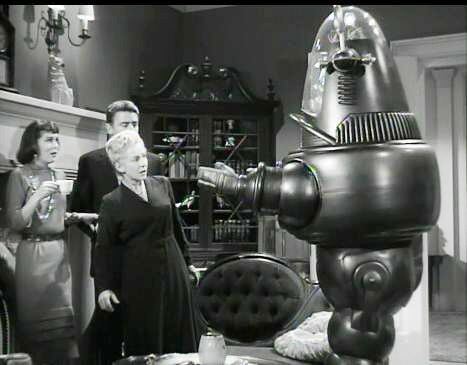 The Forbidden Planet DVD has a wonderful "extra feature" -- the 1958 episode of The Thin Man which featured Robby the Robot as the suspect of a murder in the mansion of a brilliant scientists who has built a robot to handle radioactive materials. One of the assistants of the scientist is Robert Cornthwaite, who played Dr. Carrington in The Thing from Another World. This story features Robby in numerous scenes, and his character is very important to the plot. He isn't just added as window dressing for the story. If you have the DVD of The Forbidden Planet you'll love this extra feature. I remember Robby appearing in episodes of other shows such as Oh, Susanna (a sitcom starring Gale Storm) and Hazel (a sitcom about an elderly maid who worked for a young couple). But those were just "guest shots" in comedic roles. 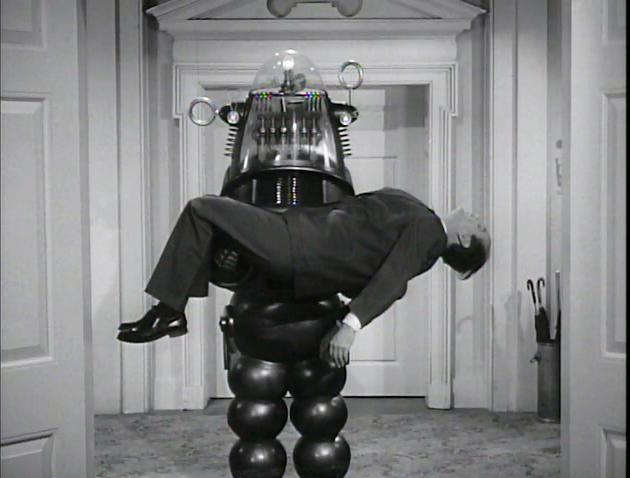 This episode of The Thin Man presents Robby in a prominent role in a serious story which allows him to play a robot who is suspected of murder. In other words, this story has a great deal in common with I, Robot! As I said, this episode of The Thin Man is a special feature on the 50th Anniversary DVD of The Forbidden Planet. The story is terrific, and it's wonderful to see Robby featured in such an imaginative roll. There were only three things I didn't care for in the show. One was the fact that Robby's moving parts (the revolving rings on each side of his head) constantly spun around at twice their normal speed. They spun around at the faster speed we saw during Robby's "shorting out" scenes in The Forbidden Planet). This made Robby seem hyper-active and frigidity during the story -- instead of the way he appeared in The Forbidden Planet, in which he always appeared composed and dignified . . . like a good butler. The second thing I didn't like was that Robby's other moving parts -- the ones INSIDE his head -- didn't make all those endearing clicking sounds every time he was about to speak. 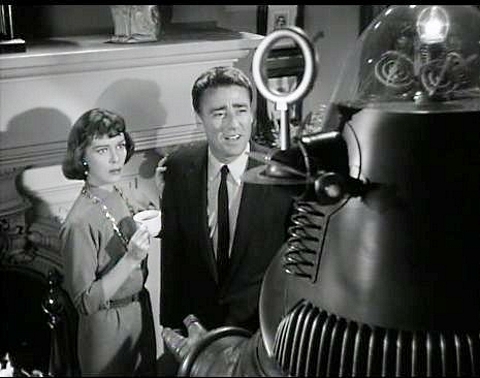 Despite these drawbacks, it was great to see Robby in this brilliant 1950s TV series. In addition to the 50th Anniversary DVD, I have the Blu-ray of The Forbidden Planet as well as the unique and superior HD DVD version converted to Blu-ray by a brilliant and benevolent genius I happen to know. The Blu-ray version contains every one of the special features on the 50th Anniversary DVD -- and they are all on one disc, amazingly enough. If you're a The Forbidden Planet fan, you're obviously a Robby fan. And since you're a Robby fan, you owe it to yourself to get the DVD or the Blu-ray version of The Forbidden Planet which contain this wonderful 1958 episode of The Thin Man. So, what do you folks think? 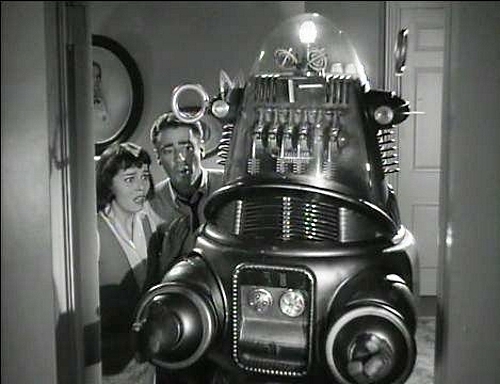 Was Robby's acting in The Thin Man as good as it was in The Forbidden Planet? Don't forget to consider the dramatic scene in which he carries the dead body of a scientist into a room crowded with people -- similar to his dramatic scene in The Forbidden Planet when he carriers poor Dr. Ostrow into Morbius' living room! Unlike the similar scene in The Forbidden Planet there are no wires visible in this shot! Youtube doesn't seem to have The Thin Man episode in which detective Nick Charles proves that Robby didn't commit murder, but Archive.org has the episode at the link below. Click on the Full Screen icon. The picture is just fine. ________________ The Thin Man with Robby! And enjoy a gallery of pictures from the episode at the link embedded in the next jpeg. I'd forgotten the episode also stars Robert Cornthwaite from the The Thing from Another World!